Our Customer Service Management adminstration main landing pages gives your customers complete control over managing their account. On any ecommerce site, it’s important for customers to be able to create accounts and manage them effectively. This enables them to save products they may come back to buy later and to track their previous orders. Having an account makes them feel more connected to your site and makes them more likely to return for future purchases. Customers can also benefit from members-only loyalty programs and website features. Customer accounts also provide you with a number of benefits. When users join your website, they sign up with their email address. This enables you to send out offers and promotions, increasing traffic and sales. You can also track customer behavior over time, gaining valuable information to improve your site and target your product offers to your target audience. For all of these reasons, it’s important to offer your customers comprehensive account options that work well. 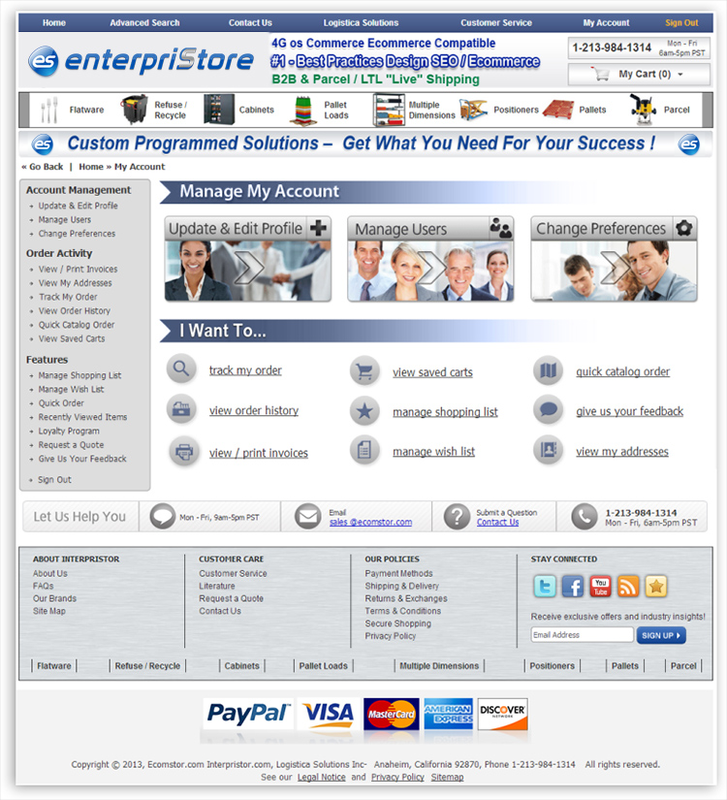 EnterpriStore has designed an easy-to-use customer management portal that gives your customers complete control over managing their accounts. It also provides them with all the options they need to look at previous orders, saved products, their account and preferences, and to contact customer service. The My Account page is well-organized so that customers can find everything they want quickly. In the left sidebar, they’ll find a list of every page related to their account, organized under Account Management, Order Activity, and Features. From these links, customers can quickly find the specific page they need. There is also a Sign Out link so that customers can sign out of their accounts before leaving your site. In the body of the page, customers will find the most common options that customers want to access. Across the top they’ll see clickable boxes to manage their account. They can click Update & Edit Profile, Manage Users, or Change Preferences. These links at the very top of the page make it easy for them to edit their account information. This will make browsing the site and purchasing products even easier. They can, for example, update their default address so that it will be accurately entered in the checkout process. Beneath the account management options, customers will find 9 more helpful links. This is where they’ll go if they need more information on an order they placed. They can click on a link to track a current order or to view their order history. They can also view and print invoices from orders they’ve placed. If there are products they haven’t ordered yet, they can view a saved cart and manage both shopping and wish lists. These options allow customers to revisit products they’ve though about buying, and it makes it easy for them to come back and make a purchase. Customers also have the option to place a quick catalog order. This is ideal for customers who have received a product catalog from you or for return customers who know exactly what they want. Right from their account page, they can quickly place an order for multiple products. This is making it as easy as possible for customers to place large orders (and for you to make large profits). Customers can also click links to view the addresses they’ve entered or to leave you feedback. These options ensure that customers can quickly access the information they want and make purchases as easily as possible. If customers have any questions, they’ll find your customer service information, including your phone number, email address, and customer service hours, along the bottom of the page. This way you can ensure that you resolve any problems and keep all of your customers happy.